I was chatting with my friend Garrett last week about using progressions in a negative expectancy game such as baccarat, and I thought our discussion would make an interesting post. In this post, I will explain why in the long run, any progression, no matter how mild or aggressive, must fail when used to bet in a negative expectancy game such as baccarat. I’ve mentioned this fact in many of my previous posts (e.g. Transcendental Baccaratology), but I haven’t yet devoted an entire post to explaining why. 1. Bet Placement: where to place your bet, for example, in baccarat, whether to bet Banker or Player. 2. Bet Selection: how much to bet for each of your bet placements. Flat betting (always betting 1 unit) and progressions (increasing your bet beyond your base bet in some manner as you win or lose the last bet) are examples of bet selection methods. Boiled down to their essences, all baccarat approaches (methods, systems, etc.,) consist of at least one of these three elements, usually, all three. Developers, players, and enthusiasts spend countless hours researching and discussing each or any of their combinations in their search for the holy grail, a system that can consistently win in the long run. However, each of the three elements can be rigorously shown to fail in the long run for negative expectancy games such as baccarat. Here, I will explain why any type of progression (an example of 2. Bet Selection) must fail for negative expectancy games in the long run. No matter how mild or aggressive, simple or complex the progression is, it will not be able to make a long term negative expectancy method positive. Not only do my computational results clearly demonstrate this, but the rationale for why this must be true can be easily and intuitively grasped. 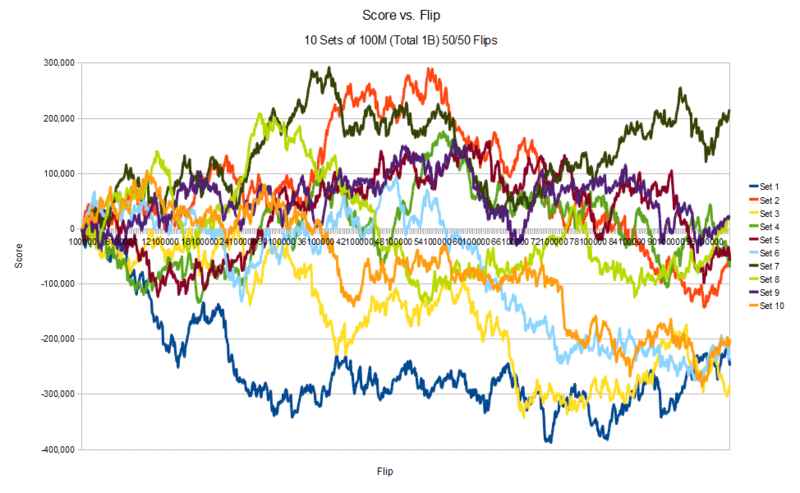 In the long run, any progression is simply a set of many different levels of flat bets. So, if flat betting is long term negative, then progressions must be, too. Since the underlying odds per decision never change, a large bet has just as much chance to lose as a small bet, so the actual amount of the bet doesn’t matter in the long run; the wins and losses will all cancel out anyway. Let’s skip right to the top to the king of kings of progressions, the most aggressive progression possible, the revered and feared standard Martingale, which doubles the size of the bet upon each loss. Start betting at 1 unit (1u). If you win, keeping betting 1u. If you lose, double your bet to 2u. If you win, you win back your -1u lost in the previous bet, plus you gain 1u, so you’re ahead by +1u. If you lose again, double your bet to 4u. If you win, you win back the -3u lost in the last two bets (1u and 2u) and gain an additional unit (+1u). If you lose, double again. And keep doubling until you finally win. So, the Martingale progression is 1u, 2u, 4u, 8u, 16u, 32u, etc … as long as your bankroll lasts and you don’t hit the table limits. In the Martingale, every time you win, you gain +1u, and every time you lose, you double the amount of your last bet. With bottomless pockets and no table limits, the Martingale is the most effective way to stay ahead of your losses in the long run. All other progressions can be regarded as some dilution of the Martingale. Now, let’s pretend we’ve played a million decisions of a perfectly fair, 50/50 coin-flip game, and we’ve thus placed a million bets using the Martingale. Of course, in reality, the actual results won’t be so nice, neat, and exact, but I use these rounded off, whole numbers to facilitate discussion and to emphasize the main conceptual point. The important feature about the results is that for each level of bet amount, the number of times you won will be roughly the same as the number of times you lost. In the limit of an infinite number of bets, the number of wins and losses will approach exact equality for a perfectly fair, 50/50 game (a zero expectancy game), while for a negative expectancy game, the losses (net after any commissions, as in baccarat) will always outweigh the wins. 2) Flat betting 1u over 500,000 decisions, flat betting 2u over 250,000 decisions, flat betting 4u over 125,000 decisions, etc. For each of those bet amounts, the wins and losses will cancel each other out at best, just as would have happened had you simply flat bet the same amount throughout. Moreover, it’s easy to generalize the above to any kind of progression, no matter how mild or aggressive, simple or complex (convoluted? ), because in the final analysis, tabulating all of the bets of any progression in the same manner as above will show the same thing in the long run: the number of wins essentially cancel the losses at each and every bet amount level. So, if you can’t stay ahead flat betting at any single amount, how can flat betting at various amounts (which is what a progression really is) be any better? It can’t! My computational results consistently show that in the long run, progressions either 1) maintain or 2) worsen the flat bet expectancies. For example, in baccarat, the flat bet expectancies are roughly -1%ish. That is, for every $100 you bet, you expect to lose about $1 in the long run. Applying a progression, the long term expectancies can still remain -1%ish, or drop to -2% to -4%ish, (lose on average $2-$4 per $100 bet), or in some cases, depending on when the simulation is stopped, be much worse, exceeding -10%. To understand this more intuitively, consider a capped Martingale, where a maximum sized bet is set, for example 1u, 2u, 4u, 8u, 16u, 32u, and no more. If you lose the 32u, start the progression over at 1u for your next bet. The capping makes the Martingale more practical, because it lengthens your bankroll’s lifetime, as well as respects the casino’s table limits. Just as we had discussed previously, in the long run, the number of wins and losses of each bet amount will be equal. But realize this: Every time the peak bet of 32u wins, your bankroll gains only +1u, but every time the peak bet of 32u loses, your bankroll suffers a huge -63u drop! And then you have to go back to betting only 1u to start the progression over. The figure below illustrates this quite dramatically. Another way to see the same result: Statistically, winning 6 in-a-row will occur just as often as losing 6 in-a-row. When you win 6 in-a-row, your bankroll gains only +6u, but when you lose 6 in-a-row, your bankroll crashes -63u! So clearly, because the expected losses are so much greater than the expected wins, the long term expectancies will be worse than simply flat betting. This is likewise true for any other progression capped at a peak bet limit. Characteristic “stair step” pattern of bankroll balance when peak bet of capped Martingale is lost. You might try to be clever and think, if my long term expectancies are significantly worse than expected for a nearly break-even game, I’ll just reverse the bet placements which had yielded -2% to -4% to become +1% to +3% (pivoting around the expected -1%). Why that won’t work is due to the progression. If a certain bet placement method yielded -4% flat betting, then, yes, reversing the bets would indeed yield +3% (and it will be a Holy-of-Holy-Grails!). But using a progression, reversing the bets won’t change the final answer. Why? Simply because everything reverses symmetrically. That is, while reversing your bets will change a 6 in-a-row loss of -63u into a 6 in-a-row win of +6u, it will symmetrically change your previous 6 in-a-row win of +6u into a 6 in-a-row loss of -63u! Gambling gurus often teach progressions as essential to stay ahead in a game such as baccarat. By doing so, they are acknowledging the underlying negative expectancy of the game. But their advice would be valid only in the short term. This is because in the short term, luck may favor you and winning that larger bet can more quickly erase a host of smaller losses which you’ve suffered up to that point. So, if your objective is to leave the casino once you’re profitable and never return to the tables again, then you would be wise to use a progression, if you can afford to, a Martingale, and pray to your lucky stars you win before your bankroll dries up. In the short term, progressions are double-edged swords: When you win, you dig yourself out of the hole faster, but when you lose, the hole becomes your grave. If your intention is to keep playing (and thus dwell within the realm of the long term), understand that using any kind of progression can be much worse than flat betting, and it will never flip the polarity of the underlying expectancies. This entry was posted on December 16, 2012 at 2:41 am and is filed under Life with tags analysis, baccarat, bet placement, bet selection, betting, computer, flat bet, Martingale, math, money management, progression, simulation, strategy. You can follow any responses to this entry through the RSS 2.0 feed. You can leave a response, or trackback from your own site. Well said Virtuoid. And thanks for taking the time to write in such detail. I’ve known for a long time that what you wrote is true, but despite having read hundreds of articles on flat betting vs progression betting etc, I don’t recall coming across the line “In the long run, any progression is simply a set of many different levels of flat bets.” I’d never thought of it that way, though I instantly recognise it to be true. P.S. you mentioned ‘Traders’ often make the same mistake. Are you refering to FX traders or equity traders etc? I’d be interested to know as I work as a trader for a financial institution dealing in derivatives. I’d be more than happy to explain to anyone who cares to write why it’s impossible for a RETAIL trader to make money in FX. I was specifically referring to traders with automated, mechanical trading strategies who run backtests over some past data set. More often than not, the bottom line at the end of the backetest is negative, so the natural thing to think is: Reverse the entry/exit logic! But, alas, when they try it, they’ll still get negative results and scratch their heads trying to figure out why it didn’t work. Would you be interested in sharing your insight regarding why it’s impossible for retail traders to make money in forex to the broader ImSpirit audience? I’d be happy to host your explanation as a post here (giving all credit to you, of course). Or, if you have a blog of your own, please post it and send me a link. Virtuoid, I agree with you on every facet of your explanation. Every bet of a progression is in fact part of a series of flat bets. Therefore progressions do you no good in the long run in random cards and commission (negative expectancy) will eventually rule, But, therein lies an assumption. You are assuming that all cards are always random – that bet placement can’t be engineered to an advantage. You are negating any skill on the part of the gambler. This is probably still a correct assumption for somewhere around 999 out of 1000 gamblers. But that one out of a thousand knows how to achieve a hands won rate better than 50/50. Moreover, he knows how to select the games wherein he can achieve the highest hands won rate or, perhaps more importantly, he knows how to avoid games where he knows he can’t achieve a positive hands won rate. He knows when to play and when not to play. He knows how the casino operates. He knows his enemy. Take Blackjack, for instance. Basic Strategy alone beats random cards. The casino knows this full well. Therefore they see to it that the cards are NOT random. Perfect Basic Strategy loses perfectly in clumped cards. Therefore the casino sees to it that the cards are clumped. They do this by picking up the mostly low break cards first and then the mostly high non break cards each round producing large mostly low and mostly high clumps in the discard shoe. The standard two or three hand shuffles won’t even begin to neutralize these clumps. The unwitting gambler plays perfect basic strategy on Saturday night against maximum clumping and gets killed against the dealer who seldom breaks – nowhere near the normal 28% break rate in random cards. Had he simply waited and played new (random) cards on Monday morning his basic strategy would have performed much better. But alas, he is oblivious to there basic facts of gambling. Baccarat is similar. Nearly every shoe dealt with normally shuffled cards (not factory preshuffled) ended up favoring either chop, streak or neutral. If the gambler correctly matches his highly practiced chop, streak, and neutral bet placement systems to his shoes along with good cash mgt, he wins. If he attempts to play only one bet placement system against all shoes, as most do, he loses to the worldwide average of 26% of his buyin money as impossible as that may seem given that commission is only 1.25% of his money bet. As proof I offer this little nugget: I was able to win nearly every Bac shoe at Gold Strike, Tunica to the tune of 20 units per shoe for 3 years straight by sticking to new cards in the morning because I knew that their standard morning card prep favored OTB4L. (Opposite time before last) (neutral). Playing with you, I was able to achieve a 26% Player Advantage for 6 shoes, probably a world record, because I knew that the first casino favored OTB4L (neutral) and the 2nd casino favored S40 (chop). Through skilled table selection my 30 year avg hands won rate in BJ is 55% against an overall average basic strategy hands won rate of 43%. Any devoted player with average intelligence can learn these skills. But, for the most part, they won’t. Too much work. They would rather use the strange excuse that losing is fun. Well, one thing we agree on – they are in for a lot of fun! Always good to hear from you, and I hope you’re well. Let me reply to some points in your comment. In blackjack, as Thorpe objectively demonstrated, the underlying odds can vary significantly depending on the history of the shoe. 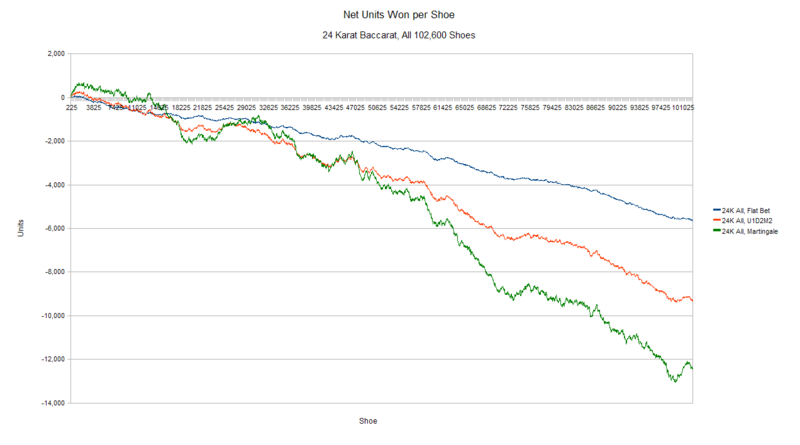 In contrast, in baccarat, the underlying odds never change (or change so little as to be unusable to gain a consistent advantage) regardless of shoe history. So, it definitely makes sense to use a betting progression strategy in blackjack, the essence being bet bigger when the odds favor you! You’ve asserted this throughout your career, one of the cornerstones of your methodology, and we’ve discussed and analyzed this in quite a number of previous posts and comments. I respect your convictions, which I know are based on your observations and experiences. All I can say is that if this world-view is still working for you, I wish you the best. In my own observations, trials, and analysis of thousands of collected live shoes, I find no objective evidence of consistent, intentional shoe manipulation. I appreciate how you keep bringing up the results of this trip. In those 6 shoes, I was there right beside you, following your every bet, so it is documented on record as authentic. You well deserve the accolades of a stellar performance that weekend. However, if you’re going to keep emphasizing your performance during that trip, let’s be entirely objective and put these 6 shoes in proper perspective. First, while you’re quick to remind us of your winnings in those shoes, you never mention the bloodbath suffered on the Friday night before the seminar officially began. Since I was still in transit to the seminar, I was not there to witness or document what had happened, but someone else who was there informed me that you kept losing, all discipline went out the door, and everyone (except Kevin who played his own system) lost a good deal of money. Indeed, the next morning on Saturday when the official seminar began, I recall you were quite visibly dejected, somber, and apologetic about the disaster. Moreover, you had decided to not play at the casino Saturday night after the seminar, and you only rather reluctantly did so when Keith kept encouraging you to play. I don’t bring up these memories with purposefully ill intent, but since you insist on bringing up the documented results of those 6 later shoes we played together on Saturday and Sunday, I think I’m justified in reminding you to frame those wins in their proper context of the previous losses you had suffered Friday night. I don’t know specifically how much you had lost Friday night, but I’m sure when totaled together, the average Players Advantage of the entire trip would be considerably less than 26%, and possibly even negative. The fact is, human nature is prone to selective memory, preferring to remember (and advertise) when we win and forget (and hide) when we lose. Since you wear the hat of marketer for your BTC forum, you clearly have an ulterior motive to emphasize your high points and conceal your low ones. Yes, I feel privileged to have witnessed one of your high points, but at the same time, I’m fully aware one of your low points had immediately preceded it. Thus, I can appreciate the proper context of your claims. If nothing else, the sample size of 6 to 10 shoes is far too small to be statistically significant, either way. 4. Any devoted player with average intelligence can learn these skills. I guess that’s your hook, that you claim to be able to teach anyone of average intelligence who’s committed and diligent to master the game. All I can say is I tried to follow your approach and your instructions, but when I failed to reproduce your results, you had an endless list of reasons why. The finger of blame was always pointed to something else: the shoes, the casino, the management, the shuffle schedule and protocol, the Shuffle-Master machine, the pre-shuffled cards, the time of day, the bankroll, the travel, and virtually everything else under the sun. Indeed, it seemed to me that the sun, moon, planets, and stars all had to line up exactly in order for your approach to succeed. Why not invoke Occam’s Razor and simply call it what it is: Luck! After all, someone would have to be just as lucky to find all the right conditions which are supposedly required to succeed with your approach as he would be to win just making a random bet at any random table at any random casino! Moreover, I could not find a single member at your BTC forum who was consistently winning with your methods on a professional basis. Actually, I found BTC broken up into various factions, some of whom were scared into silence, and so left to their own devices to conduct their own development work in secrecy. The bulk of the rest of the BTC members simply anxiously await the next flavor-of-the-month of system, after the system from the previous month was found to be flawed in some manner. Ultimately, I found the forum interactions so discouraging and unhelpful that I decided to simply stop participating. I haven’t logged in for over a year now. I guess this reply is turning out to be a post in itself. Perhaps I will more properly formulate my thoughts about my experiences at your BTC forum into a full post. But thanks for continuing to drop by my humble blog and keeping in touch. Like I always say, I sincerely hope you’re genuinely helping others to master the game. Very articulate and factual post Dave. I seriously doubt whether Ellis will still reference this blog anymore (Ellis just loves the 26% PA story and uses it to market his site to newcomers) after reading this latest reply from you but it is the truth, and sometimes the truth hurts. The Net Betting talk was hot and heavy for a while but fizzed out as quickly as it started. NORA is the ticket now, or more specifically OTB4L Advanced. Of course this fits the mold of the current flavor of the month club his forum is famous for. I haven’t been there BTC for a long time either. Once I went back I found my posts all gone. Yup, he (Ellis) would never be able to show proof of his ‘table selection’. I’d kept saying that it’s a shame for a math teacher never believes in statistics. Good to hear evidence that Ellis always walks out casino with winning is incorrect. It can’t be true from the first moment I learned about that ‘myth’. It sounds more like a market strategy for his paid forum. Manipulation of the shoe is a very danger game because once they are in play no one can tough the cards in the shoe any more. If you think they are manipulated against you, you can just play the otherwise way and you will WIN; and casino can do nothing again because they can’t open the shoe unless stop the game. What an easy way to beat ‘manipulation’! Long time lurker, first time poster, I have found your interest in studying the various aspects of baccarat interesting, and I think that you have done a really good job in making information available on systems and methods. I hope that the next time you are at Rivers Casino in IL, you will stop by the tables to say hello. I have one question, what kind of time horizon would you use to define the short term? Regarding your question, the answer is somewhat paradoxical, and yet makes total sense when you think about it: Whenever you’re playing a shoe, you are both in the short term and long term at the exact same time. Short term, because anything can happen in that shoe: You can get lucky and win a bundle, or you can get unlucky and hit your stop loss (if you’re disciplined; and if not, then you may lose everything). Long term, because you’ve returned to play one more shoe in the first place. Whenever you go back to play a shoe, you’re dwelling in the long term. As you’re playing that shoe, you’re playing in the short term. The long term is the big picture, the entire downward sloping line in my graphs. The short term is any individual shoe on that line. You never know where that shoe lands in the larger picture, but you are definitely in it. The short term is a tree. The long term is the forest. I always got a kick when the folks at Ellis’ BTC forum flippantly disregarded the long term. While they’ll happily agree that baccarat is long term negative, they can’t for their lives understand why they should care. I chuckle at their inability to grasp that the very act of starting a new shoe enters them into the long term. Why should you care about the long term expectancy? Because it tells you where you’re headed if you keep going back to play. It offers a bird’s eye view, allowing you to see the entire forest instead of just a tree. Masterful blackjack players have a reason to go back to play: their long term expectancies can be net positive. The math gives them confidence they can weather the short term drawdowns, because the math is on their side. The more shoes they play, the more they can expect to win. Good baccarat players should know they have no good reason to go back to play: their long term expectancy is net negative. The more shoes they play, the more they can expect to eventually lose. In terms of hard numbers from my simulation results, the long term expectancies are clear well before a few hundred shoes which are bet every decisions, which is roughly on the order of 10,000 to 20,000 or so bets. By then, the graph line is decidedly sloping downward, and the variance is always in the red, regardless of the magnitude. Thanks again for asking … I think your question can actually be the topic of a full post! Unfortunately, yes it takes about two hours to get through a mini-bac game. The big tables can be even longer per game. Sometimes almost 5 minutes between hands. You can catch me at the mini bac tables usually on the weekends. If you have a chance be sure to take a look at my book on baccarat which is posted online and it is free at the location indicated in the website field. (out of respect I won’t post it here.) Anyway, I make reference to your work in that book and furthermore, I define the “long game” and I am working on summarizing and posting the results of nearly 200 hours of live game play of which, the first 40 hours has been posted already. I hope that you will find it a good read. That’s what I hate most about bacc at Rivers, how slow the games are. And what I like most is what you mentioned in your book: smoke free! I did read your book (Playing The Empire for Fun and for Profit: A Gamblers Guide to Baccarat, By Lee Evans), and thank you for sharing your insights, knowledge, and wisdom, and I’m flattered you mentioned my blog. Breaking even after $300K of total bets is quite an accomplishment in and of itself! I agree with much of what you wrote, but there were some points which may be good starting points for more discussion. I would like to dispel the myth that no mechanical system has a chance at winning baccarat in the long run, and while I agree with the overall sentiment of such an assertion, I completely disagree with the proposed alternative of relying on bet placement systems as a viable alternative. So, it sounds like what you’re saying is that you believe a mechanical system can win baccarat in the long run, but bet placement is not an aspect of such a system. From the thesis of your book, it sounds like instead, you believe money management (when to start and stop betting, and which in your case also includes bet selection, how much to bet) is the key to a long term winning system. If money management and/or bet selection can win baccarat long term, then that necessarily means money management and/or bet selection changed the odds of the game. If money management and/or bet selection can win baccarat long term, then that necessarily means money management and/or bet selection can create an advantaged bet placement, that is, one that wins more often than loses. In other words, you’re contradicting yourself by saying baccarat can’t be won long term through bet placement, but it can be won long term with money management / bet selection, because to win long term with the latter necessarily means you’ve somehow managed to win more bets than lost, which means you have actually discovered an advantaged bet placement. In other words, a holy grail of money management / bet selection is conceptually and mathematically equivalent to a holy grail of bet placement. Coming back full circle, no system involving any or all of the three elements (money management, bet selection, bet placement) can win baccarat long term simply because nothing you do will ever change the odds in baccarat. As you wrote, the notion that you can make a advantaged bet placement is an illusion. But if that is true, then the notion that you can become long term profitable using money management / bet selection must also be an illusion too. They are powerful illusions, because they give you the sense that you’re in control of your resources. In fact, the odds always remain the same no matter where, when, or how you bet. Hence, your long term fate is sealed no matter what you do, no matter how disciplined or not you are. That is why casinos know they will always win when it comes to table games such as baccarat, roulette, and craps. The long term is firmly on their side. Let me first concede that my comments as worded are confusing and contradictory. Let me go a step further and try to clarify my ideas. 1. I think that money management (what you bet and when) has a greater importance than bet selection (where to bet). My reason for this belief has to do with hit and miss ratios or win loss patterns that create misses at a greater percentage than is delivered by the game i.e. the zig zag effect. I agree with the mathematicians that backing the banker gives you the best chance for success over the long run because it has the lowest edge. Furthermore, I am a big advocate of single sided betting or what I call line betting because your hit ratios will never be worse than what is delivered by the game. Coupled with progressive betting and enough money to survive the sags you can ride the volatility from the left of zero back to the right of zero. 2. While I agree that bet selection (where to put your money) and money management are aspects of the same thing, I think that where they differ is fundamental and that is, I think that bet selection is primarily about predicting the future, where as money management when doing single sided betting is about responding to the past. Therefore, what I do is based on what has happened rather than what I think is going to happen where whether I win or lose is strictly left to the math which tells me that it is virtually impossible to suffer a 100% wipe out. That is of course, if we completely ignore the function of the edge which is grabbing pennies from the action as it take place. We know that edge will eventually consume the entire value of the bankroll but volatility is always overwhelming edge. If it were not so, then no one would play. Which means by extension that you could win at any point or lose at any point but never just one or the other but both. A players ability to survive from round to round is a function of how they apply their money to game. 3. It has never been my intention of beating the edge in the game. I accept that as an indisputable fact. It is the price we pay for the entertainment. However, I think with smart money management, your money can take you further. For instance, I am a big advocate of playing casino games at their expense. Not because I hate casinos or think they are evil. I think that they should be compensated for hosting the games. However, I have little interest in leaving piles of my money with the casino. So I play enough to boot strap a bankroll, take out any cash I actually spent there and then circulate their money back to them. Therefore, if you see me wipe out at a table doesn’t happen often, but I know that it can happen at any time, I am simply returning what I’ve gained with no personal monetary net loss. Therefore, as long as I am ahead, I always retain the option of cashing out and if I am behind, the math says that at some point I will be ahead. Greed, fear and recklessness can change this basic balance by causing your losses to balloon out of control. 4. If I am asserting anything, it is that there are trends and meta trends and as long as a player can monitor their relationship to zero that is, how far to the right or the left of it they are, they have a good chance of being able to get off the roller-coaster at a point that is advantageous to them. If we are taking advantage of anything, it is that there is an ebb and flow and absent the house edge our prospects are beak even which means that we couldn’t win 100% of the time if we tried but by contrast we couldn’t lose 100% of the time either. Therefore, the rate and the actual point in which we go broke is a function of how we apply money to the game. I watch people do this extremely poorly almost every time I play. Thanks for your clarifications, Lee. They definitely help make things clearer, and I appreciate your perspectives. Let me challenge you with another thought, though. Just as you’ve recognized the mathematically best bet placement (that of banker always), you should also be able to identify the mathematically best money management / bet selection, the one which will give you the best chance of reaching your target. Let’s make our target goal to double our bankroll. So, mathematically, what money management / bet selection will give you the best chance of reaching the goal of doubling your bankroll? 1. From the theory of gambling and statistical logic. Maximum boldness. Your best chance to double your bankroll is to place a single bet for the maximum amount of money you wish to win. I’ve done this at least once because it was my best option. However, I don’t think that I will do it again. If you are never going to play again then you should place a single bet on player for the maximum amount of money you wish to win. In my case, I was betting banker in a shoe in which banker was losing at a ratio of 2:1 and at points 3:4 and the game had been grinding away at me from the start. Having reached my bust point of $3,000. I decided to stop messing around and place a single bet for $6,000 and I won. That put me a head by an additional $3k which saved me 30 hours at the tables. However, if I had lost that bet I would have lost $10,000. Which is why I won’t do it again. I actually enjoy playing at the casino so as a function of utility, betting like that isn’t a good choice if you cannot sustain it. 2. The next answer comes from Michael Shackleford of the Wizard of odds. If he were trying to double a bankroll he would place a single bet for the total amount of money he wanted to win on player and then he would martingale until he either won the amount of money he was trying to win or bust. 3. My approach is somewhat a combination of those two extremes. But basically, amounts to making sure your average wins are greater than your average losses. Let’s say you have 1,000 pennies and your opponent had 1,000,000 pennies. You have a 0.0009% chance of capturing all of his pennies. He has a 99.9% chance that he will be able to capture all of your pennies before he goes broke. Since volatility can favor you as much as it favors your opponent you will use this to your advantage. By slowing the rate at which you lose pennies and by accelerating the rate at which you win them. Therefore, each of your pennies has the potential to fetch 3-8 times the number of pennies you put out there: Furthermore, you are constantly restoring the pennies that you lost in fewer cycles than it took the lose them. So you are in effect running out the clock on the volatility without forcing an increase win the swings. If you can survive the sags, which can be calculated with some level of confidence, then there is a good chance you will restore lost pennies and grab some of his. The more pennies you have the longer sags you can survive, the more sags you can survive the bigger your collection of pennies the bigger your collection of pennies relative to his, the more chances you get. In effect, you are grinding away at your opponent much in the same way the edge is grinding away at you. It is winning through what amounts to compound interest. I talk about this in Chapter 8 Playing the Long Game, Understanding the Utility of Money when it comes to casino gambling, Lesson 12 “Gambling is a hard way to make and easy living” and Chapter 9 The first 40 hours of baccarat. Which is a summary of 20 shoes of baccarat in which I won 17 of 20 games, busted once game #18 for $2.3K and netted $5,420.00 (average wins were greater than average losses.) I am working on posting the rest of the results, I will also provide a book of shoes with completed money sheets for those that are interested. I hope that this answers your question. Thanks much for your well-thought through answers. Sounds like you’re got your plan of action in place. Dave’s comment to Lee Evans that “you’re in the long-term and the short-term” at the same time is relevant because each bet theoretically faces the same negative expectation as every other, but at the same time, a second consecutive loss is half as likely as an isolated loss and twice as likely as a third consecutive loss. So in gambling, you’re always at the mercy of two axioms that are frequently in conflict. However, the assertion that in a Martingale, every bet value (1, 2, 4, 8 and so on) or bet level, if you prefer, is subject to the same NE is just plain wrong. It’s a simple matter to write a worksheet-based sim to test this idea, and I believe Dave knows that and for some reason chooses not to go there. I just modified one of my own sims to count wins and losses at each level, and while each time the sim is refreshed, the house enjoys a clear advantage at the lower levels (1,2,4,8,16) player wins at the higher levels routinely outnumber house wins, creating a player edge that explains why casinos do all they can to thwart Martingale bettors. 1) A player must be willing to keep on betting through even the most punishing losing streak, until he finally wins the bet that covers all his prior losses, plus one unit. 2) The casino where the above player is applying his reckless Martingale must be willing to accept whatever bet he chooses to make. Since neither of those conditions exist in the real world, there’s not much point in the concept, is there? Casinos apply tight-spread table limits specifically to block Martingale betting, although they will tell you that they do it because high rollers don’t like to play with penny-ante bettors and vice versa. Rubbish! Dave might find it worthwhile to actually try an extended Martingale in one or more of the casinos he claims to frequent. He’ll encounter all sorts of obstruction, especially after he’s a few hundred bucks ahead. Personally, I’m not a “Marty” fan, although progressive betting has been working well for me for more than 30 years now. The trick is to bet progressively, but not in exactly the same way all the time. For example, if the first bet in a new series or session wins, add 1 unit next time, keep doing that until a loss, then apply the standard x2 procedure until a win recovers prior losses. At that point, start over with a minimum bet. Alternatively, freeze or halve the bet after a pre-set number of losses, parlaying in response to every win until prior losses have been covered, then starting over. The “prior losses plus one unit” win with a standard Martingale is a lousy incentive, especially after a prolonged losing streak has pushed bet values into four figures or higher, so 1,3,7,15,31,63 etc. can make the game more interesting and more rewarding. It’s true that a “mechanical” method relentlessly applied is bound to fail after a few bazillion rounds, but who bets that way? I often lose in the short-term, which is why I’m always welcome at casinos in my neighborhood, especially those with tight-spread table limits. I’m a hit-and-run player whenever I have to take my low-level losses and seek to recover them with bigger bets in higher-level stores that I don’t visit so often, so I keep my head down (no names, no cards, no comps) and fade away whenever I’m back in the black. I suppose there’s some point to Dave’s efforts to convince gamblers that the math is against them and they might as well get used to losing or give up and stay home, but I admit I have no idea what that point might be! I absolutely agree with Lee Evans that what you bet on (Banker or Player, Red or Black, Odd or Even) is irrelevant – the only thing that matters is how much you bet and the relationship of each bet’s value to the amount you need to recover in order to end up ahead in spite of losing more rounds/wagers than you win. The suggestion that progressive betting seeks to magically change the house advantage (simply defined as the ratio of losses to wins) is, again, disingenuous piffle! Dave likes to do the math, so let’s look at 100 bets with a 2.0% house advantage (51 house wins, 49 player wins). If the player bets randomly, and the average value of his 100 bets is, say, $100, then he’ll end up in the hole to the tune of -$200/$10,000 (action) which is -2.0%. How about that! But if he uses progressive betting to ensure that his winning bets are worth an average of $110 and his losing bets cost an average of $90 – easily done, as the sim Dave knows how to write will demonstrate – the outcome changes in the player’s favor, but of course the house advantage (more player losses than wins) remains exactly the same. Here are the numbers: (+49 x $110 = +$5,390) + (-51 x $90 = -$4,590) = +$800/$9,980 = +8.0%. I know for sure I can’t change negative expectation in the long run, because casinos would not exist if there was a way for me to win more bets than I lose. What I can do is make sure I win more when I win than I lose when I lose so that losing more often than I win won’t hurt me in the long run. Dave could do it too…if he’d just do the real-world math instead of playing for the other side! Glad to hear you’re still making a fortune at the tables, Seth, and that you’re helping bright folks like Lee. Anyone else can readily reproduce and objectively verify for themselves anything I’ve presented. The truth can stand on its own without my help. I’m merely recording my findings for my own documentation. If you believe you have the key to beating the casinos, please go make your fortunes and teach those interested in your approach to do the same. there are a few things that confuse me as it relates to the long term expectancies of the game and perhaps you can help me. First, I think there is a relevance factor when it comes to the mathematical models which show graphs crashing to the left of zero. Correct me if I am wrong, but it is my assertion that this “tanking” effect is not due to any fundamental changes in overall volatility (or is it?) but rather, simply a recognition of the erosive effects of edge on a fixed size bankroll? Or to put it another way, aren’t we really just seeing the growing cost of the games relative to bankroll? As I do for my simulations, if you graph the net score versus the number of shoes (or decisions) played, the volatility will hug a downwardly sloping line. Eventually, the line is so far below zero that no amount of volatility will ever bring you back above zero. When you are under water, the difference between where you are and zero, of course, is your net loss to the house, and so that average line in the long run is simply the vig. Another way to look at it: if you averaged the results of an infinite number of bacc simulations and graphed the averaged net score versus shoes (or decisions), you will find all the volatility cancels out and what remains is a perfectly straight, downward sloping line, and the magnitude of the slope corresponds exactly to the house vig. I think that we might have discovered our source of conflict. Without the edge, the games would proceed along a horizontal axis where the volatility would flow above and below zero and once you average out all of the peaks and valleys, the net result would likely be zero. Most models show this by adding the cost of the game as function of the total action this creates the downward slope in all of the diagrams. However, when you use progressive betting or target betting (Seth), you are creating a disparity between your average win and average loss. This disparity has the same effect on edge as volatility and that is: (Average Win – Average Loss + Edge) = Net Positive. The hallmark of a good game designer is to bury the edge of casino games so that the cost of the game is not perceptible to the player but most of us know that it is there and we also know that it will account for a fixed percentage of our total action because it is always grinding away a little at a time with every bet. So in essence what is really happening from the players prospective, is zero is trending at the center of that downward sloping line instead of simply remaining on a horizon. Therefore, the way the calculations are done to show the negative effects of the house edge. Could be applied to trading or investments. For example, what would happen if you added fees to the performance of market trades based on volume would those graphs not show the same kind of downward slopping in addition to the volatility because those fees are sucking money out of the gains and functioning much the same way edge does in a casino gambling but I don’t think anyone includes that in their models. I am not saying that I think that gamblers shouldn’t know how much the edge is costing them but I am somewhat sympathetic to those that cry foul when edge is used to show that no matter what you do everything accelerates to the left of zero over time. But this isn’t limited to gambling or trading it is also true of taxes as relative to your income. Its erosive and grinds away at you and over time it consumes more and more but seldom are these things presented or even calculated as a function of performance. I am not trying to pick a bone with you. In fact, I like bouncing ideas off of people and while I cannot speak for Seth, I think that his frustration is somewhat related. If I am even remotely correct about this. I don’t think that we would be breaking any mathematical laws to simply show two lines: One of overall performance relative to the volatility on the horizontal axis where it belongs and another line showing the relative cost of edge as a function of total action. It is getting late for me and I thank you in advance for entertaining my foolishness. I appreciate you’re trying to find a common denominator, but I don’t think leaving out the house edge is the difference. I can only speak about what I do, and it only makes sense to me to study the game as realistically as possible. You’ll have to check with others to see what they do, but if they purposely omit the house edge, their results would not be relevant to real-world baccarat. But since you bring up removing the vig, I have studied perfectly fair 50/50 games (e.g. fair coin-flip), and posted the results at: 50/50 Coin-Flip Simulation Series 27 Results: I1 Setups. Examine carefully the results of those 10 sets of 100M (=1B) flips in relation to the zero line. Consider the behavior of the volatility of the actual flips. Do they look anything like the nice sine-like graphs plotted in your book? Fact is, representing volatility as nice sine-waves around zero is as much an idealization as representing the average as a perfectly straight line: it only occurs in the limit of an infinite sample size. In one of your above replies, you wrote, Therefore, as long as I am ahead, I always retain the option of cashing out and if I am behind, the math says that at some point I will be ahead. Are you so sure that’s what the math says? My 50/50 results clearly show that even in a zero-expectancy game, the expected volatility can take you far, far from zero, possibly never to return in a human life-time of play. Whether you get on a positive or negative or zero trajectory is a matter of pure luck: you have no control over it, no matter what you do. If you can’t be sure of getting back to zero in a perfectly fair game, what chance do you have in a negative expectancy game? And, even if you have the odds on your side in a positive expectancy game but your opponent’s bankroll is bigger than yours, you still have to deal with gambler’s ruin, in which case, aspects of your money management / bet selection may indeed make a substantial difference in the long run. Lee, you mentioned you once placed an all-or-nothing kind of bet to double your bet and quickly recouped your prior heavy losses. It worked out for you, but you promised yourself never again, because, in your words, betting like that isn’t a good choice if you cannot sustain it. At the same time, you correctly acknowledged betting it all on one hand mathematically gave you the best chance of attaining your goal. 1. I’m sure you would be the first to acknowledge that it was sheer luck that you won that all-or-nothing bet. You could have just as easily lost. Yes, you had the choice to decide to bet it all on one hand, but that choice had nothing to do with the outcome. If you had lost, we may not be having this conversation right now. But you won, learned a lesson, promised never again, wrote a book, and have a great war story to tell. 2. So, now you’ve decided instead of betting all-or-nothing, you’d prefer fractioning up your bankroll into smaller units, the more the better, and to utilize whatever money management / bet selection procedures to try to make your bankroll last as long as possible. Mathematically, though, the more bets you make, the greater the odds grow against reaching your target. Nevertheless, for psychological and sociological utility, you choose this money management / bet selection procedure instead of the mathematically optimal one. That is your choice. But – and this is the point – whether at the end of your betting you will be up or down will again be a matter of pure luck. In fact, whereas your odds of winning were greatest and closest to 50/50 in the bet-it-all choice above, now your odds are actually stacked against you. So, with the money management / bet selection you purposefully chose, you will more likely be down after your betting than up. From a purely logical perspective, your choice worsened your odds, not improved them. 1. Maximal odds of success with a single, large bet. 2. Less-than-maximal odds of success with many smaller bets. It’s easy to see that sheer luck is involved in #1. Sheer luck still controls the outcome of #2, but it is much less obvious, since it gives you the illusion of control. Fact is, your odds of succeeding with #2 are now even worse than #1. Nevertheless, the irrational choice is usually preferred because it prolongs the agony (or joy, depending on your perspective! ), as luck is merely drawn out. Well, I actually wasn’t going to spell this all out after I originally asked the question, figuring you already understood based on your excellent answers. But since the discussion continued, and a need arose to clarify this issue about the house edge and long term expectancies, for the sake of other readers, this might be helpful. About trading and investments: Yes, we definitely have to factor in their costs, and yes, the spread and transaction fees definitely can make it harder to yield positive returns. The nice thing about trading is that there are no mathematically sealed long term expectancies. Market inefficiencies can arise which provide legitimate advantaged plays for those who possess the knowledge, skills, and nowadays, technologies to recognize and capitalize on them. The business of trading is vast compared to that of casino gambling for this reason. But at the same time, the not-so-nice thing about trading is that there are no mathematically sealed long term expectancies(!). Being an organic entity, the markets are forever changing, always tending to neutralize those inefficiencies. So, what works today may not tomorrow. And how do you objectively know when your method is suffering merely a temporary drawdown compared to a permanent failure? The open-ended nature of the markets provides endless opportunities for both reward and ruin. 1. Of the various shoes you have in your collections how many of those shoes are composed of all banker events? 2. How many are composed of all player events? 3. How many are composed of all ties? 4. If you can find any of these what percentage of the total do they represent? Assuming you can’t find any of these let’s move up a level and go for the largest disparity you can find in the shoes. For example, how many shoes of the total where one side beats the other side by 75, 65, 60, 50, 40, 30, 20, 15, 10. It is therefore, my assertion that the lower these numbers, the more frequent the occurance. I realize that this might be stating the obvious, but my point is that there *is* a mathematical certainty that I am bound to encounter one of three events in every single shoe that I play unless of course you tell me that there are shoes that contain no banker hands and no player hands or ones that are composed of only ties. It is therefore, on this level I make my claims regarding what the math tells me about the game. I will concede and I absolutely agree that as a player, I have two problems that I cannot solve or control and that is the order in which I encounter the disparity or as it relates to my bankroll or my ability to survive the downswings which can end up being longer than my ability to bet against them. In my book I make reference to the fact that because there is volatility at every level of the game, you are always forced back into a binary position in which you will either be wrong or right. My gamble is simply this, I am assuming that I will encounter the most common types of shoes at a greater frequency than I will encounter the ones that are “bad” for me and my chosen method of play. The numbers tell me a few things that “I think” I can place some confidence in. First, they tell me that the most common event is banker, second they tell me that the most common grouping of events are singles followed by doubles. Therefore, if I design my play around what I believe to be two well established mathematical characteristics of the game then I can assign some level of confidence that I will encounter those events at a frequency to meet my gambling goals. Obviously, I accept the risk that every time I sit down at the table I would end up showing up for the shoe that is bad for my method of play and I concede that this can happen so often that I could go broke. Which reminds me of a conversation that I had with another player who remarked to me about me betting for banker when it was his experience that the majority of shoes were player dominant. I reminded him that the games run 22 hours per day on 7 tables, and based on me being there at different times, I could assure him that his observations were correct for his exposure to the game but in no way were they a representation of the overall reality. Regarding my all-or-nothing bet. I agree that I could have easily lost that bet. 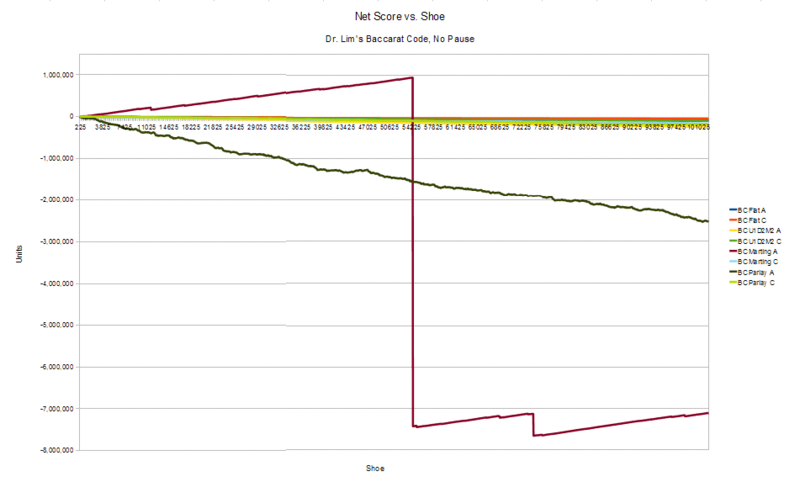 I also agree that I could have easily lost every single shoe I’ve ever played in the casino, but I think that the math makes that an unlikely outcome just as winning every single shoe I played would also represent an uncharacteristic deviation from the norm but maybe not when we are talking about very large numbers. Which I think is were we differ, when you use a mathematical model to map a game, you are tracking along a single path through absolutely every single possible outcome or an aggregate of many different types of outcomes to reach a conclusion. When players play a game, they are playing for much shorter periods of time and their experiences will track along the expected outcomes, some will win, most will lose and others will break even. How each player experiences this will be different but in my estimation experience is shaped by two factors. First is an event match criteria and second is money management. Therefore, each player would in effect be creating his or her own graph which is independent of what is happening at and aggregate level. Therefore, if you took your graph score vs flip and imagined that each line would represent a single player’s experience based on individual exposure to the game you would understand what I am talking about. I too am enjoying our conversation. The disparity data you’re seeking is in my previous post Disparity Data. Ellis, Mark Maverick, and Jerry Patterson, among others I’m sure, all have designed systems which try to capitalize on disparity. They aimed to make disparity a science. I believe Ellis once led a three-man team (I had dinner with them one night in Atlantic City) who played a system based on disparity full time with a bankroll funded by a pool. They enjoyed phenomenal months of winnings and were the stars of the baccarat community. Until one day, they blew it all at once when a black swan event hit. I forget the details, so Ellis, feel free entertain us with the tale. I tested Mark Maverick’s Disparity Method in Series 10. Mark used this method quite regularly at the tables, and in his live play, claimed he never lost a single session. I also tested a proprietary disparity method, the author of which claims to be consistently winning bundles using it, in Series 28. Note that I also used a comprehensive money management procedure in some of the tests. The details are described in those posts. It sounds like you have your own version. My advice is to run Monte Carlo simulations on it to quantify its long term expectancies, if you haven’t already. The math merely states that at any given time, a sufficiently large set of results when averaged together will be close to zero (exactly zero in the limit of infinity). That’s the only mathematical certainty that exists in the moment. Well, the bottom line is this: I’m delighted to know that you love the game, know it, enjoy it, and share your experiences to genuinely help others. As the old cliche goes, the journey is more important than the destination, and it sounds like you’re having a wonderful journey! Thanks for pointing me to the disparity data. my discussion with you is helping me to refine my conceptual understanding of the game. The pleasure is mine, Lee. Hey – I had an idea for an upcoming ImSpirit post … how about I “interview” you with, say, 10 or so questions about your experiences and perspectives, and I’ll post your answers in a post verbatim? Awesome! I’ll email you some questions over the weekend. Where’s the post? I’m dying to see/read the interview. My bad … I got too busy to compose the interview questions for Lee. But I shall try soon. Thanks much for your interest. Update: I just sent 10 fun interview questions to Lee. Will post them when he responds. Dave, I just finished sending you a draft of my answers. Looking forward to a great discussion. Thanks so much, Lee! Will be posted shortly! Beating 10 million spins is not the same as beating 10 million bets. For example, I can easily beat 10 million spins by simply waiting until the 9,999,999 spin and then making a single bet. If I win that bet, then I won 10 million spins but actually only 1 bet. Of course, the above example is an extreme case, but it is made to emphasize that the important metric is not how many spins you beat, but rather, how many bets. I don’t know what your bot does, but I’m pretty sure that it didn’t win 10 million bets. If it bets infrequently, for example once every few hundreds spins, then you need to factor that into your analysis and extend the data set appropriately to be able to make an apples-to-apples comparison. For example, I have many methods posted here on my blog which, betting every decision, have net won over a stretch of 100,000+ decisions within table limits and bankroll constraints. That success rate would be comparable to a method which won over 10,000,000 decisions, but which only bet once every 100 decisions. (100 x 100,000 = 10,000,000.) So, on an apples-to-apples basis, your bot’s performance is comparable to mine. Nevertheless, in the long run, both will fail. You simply have to test over a data set 100 times larger than mine to find the breaking points, because it’s the number of bets, not spins, that’s important. Another important consideration is how practical a method is to play in reality. At the tables, is it really practical to play a method that only bets once every few hundred decisions? That is, what is the method’s return on investment on an hourly basis? In terms of time, a method which only bets once every few hundred decisions would have an hourly return rate that’s dismally small, unless you are risking a huge bankroll, in which case, there must be much more efficient and effective ways of making money. Also, if you’re using such bots at online casinos, beware that online establishments have capital preservation sensors in place and will not hesitate to deactivate accounts which exceed the expected norm of winnings. They may let you win when the stakes are relatively small, but if you start winning larger amounts, they will simply close your account. Land based casinos do something similar by barring extraordinarily winning players. Casinos are in the business of making money, and they will do whatever they have to to preserve their profits. For online casinos, it’s extremely easy to detect and shut down the winners due to having direct access to your personal account information and history. Well, it is actually based upon betting upon hundreds of triggers whenever they arise which is not possible to be done manually, but a bot can do that. Betting may start from 10th spin or at times may remain suspended for a few hundred spins. It all depends upon what kind of triggers the bot is getting at a time. Rest you can see at graphs yourself and understand how well it does. I have not seen anything else that can be compared to this. Did you? Yes, I have several examples of comparable results in my simulations. The characteristics of those graphs, such as rapid recovery after steep drawdowns, are signature patterns of rather aggressive betting progressions, such as Martingale and Parlay. Have you done or seen any simulation doing so well on 10 million spins? Again, you’d need to express that number as how many bets, not spins, in order to make an apples-to-apples comparison. Otherwise, as in my earlier example, it would be trivially easy to beat any set of 10M spins. Whoever ran those sims should be able to immediately tell you the actual number of bets it placed. Also, the fact that the method uses so many triggers makes me highly suspicious that the results are over optimized. That is, that method is highly fine tuned to win a particular data set by simply excluding the relatively small percentage of fatal patterns, but if allowed to run on a different, arbitrary data set, it would quickly fail, because the patterns which had succeeded in the optimized set now fail. This is a common practice and mistake committed by programmers of automated trading bots, which may perform spectacularly against historical data, but quickly flop running forward in the live market. It’s commonly known that there are many grand challenges offering huge cash prizes to anyone who can beat an arbitrary dataset of 1,000,000 spins, betting at least a certain minimal frequency which the contest rules impose to make sure the challenger makes a statistically significant number of bets. If that bot could really win against an arbitrary data set, well, it should have won those grand prizes already. Or, any hedge fund manager would gladly offer you a share of profits for being allowed to use such a method if legitimate, and the bot’s author would become a billionaire very quickly. The fact that the author has not won those prizes and is pedaling his product to internet strangers tells me more than anything else. Virtuoid, you are but a gentleman. To put up with this nonsense and reply with patience, well, lets just say its a skill I’ve yet to master. It’s the little I can do to offer some sanity to the world, not that it makes any dent at all. By the way, still looking forward to posting your article on the innards of forex market makers, whenever you have the time to write it. It is not an arbitrary data set but two data samples of 1 million spins each, one of 3 millions spins, and a few dozen sessions having thousands of spins that were tested. If you see the debate page carefully, you can see that itself. Even if you bet anything after thousand spins, you can’t ensure a win in arbitrary manner. We are not winning one chip in 1 million spins. I do not think that anybody has ever done anything like this in any open forum. As you confirmed, in your case, “it’s not an arbitrary data set,” and, “… you can’t ensure a win in arbitrary manner.” That is exactly my point: your sim is highly fine tuned for your specific data set and will not be able to consistently win over other, arbitrary data sets, and thus not in the real world. Also, you never replied with the number of bets, not spins, that your sim made. Again, my point: To be a legitimately winning method, it will consistently win a statistically significant number of bets over any arbitrary data set, not just the ones it is finely tuned to win. It’s becoming clear to me that you’re unable or unwilling to see the point. Sir – if you believe the bot is the holy grail, stop wasting your time here boasting about the pretty pictures it can draw. Rather, employ it with every spare penny and second which you have on this earth to make your bountiful fortunes. To that end, I always wish you the very best of luck and success! The 10 million data have been taken from a variety of sources and no reverse engineering is possible of so many different sessions. Some of the sessions were given by a few members too which were also beaten without ever losing more than winning. The triggers, progressions etc are well defined and configurable by the bot. Only problem is so many triggers and progressions are not manageable without the bot and this makes the bets humanly impossible to do. I feel that a method that wins upon such a vast probability without ever touching table limits and always winning more than losing can be rightfully called a Holy grail. All these testings were done and shown in public not to boast about anything but just to prove that the game is not unbeatable in itself. It can rather be beaten within a reasonable table limit and bankroll. Thanks for your explanations. Godspeed on your fortunes. Albalaha, will you please state how many bets were made. You have been asked this question repeatedly. Furthermore, I suspect you are the victim (or about to be a victim) of an age old scam. Your comment “it’s not possible to reverse engineer the data” is a common misconception – especially in FX markets. We call it back testing – and it’s the biggest scam going around. I could organise for you ANY AMOUNT of data sets you wish and all of them will say whatever I want them to say. I will then say “it’s not possible to reverse engineer the data” – and you will believe it. Why? Because I said so. Does that make it true? No. The only way to realise if there is manipulation (or data shopping for historical results) is to run a sim yourself and if it exceeds the parimeters as carefully explained by Virtuoid then you know you are being had. But you don’t have to believe Virtuoid or me, just consult any high school math book and you will see that statistical deviation from the norm was invented for a reason – to stop people like you from being robbed of their money by those who would prey on the ignorant. Take warning my friend. I may be mistaken, but I think albalaha is a promoter of the system. If so, his comments should be carefully evaluated in light of his marketing efforts. Of course. How did I miss that. I merely consulted a bit in the development of the bets and progression in the said bot and the bot has been developed by Ophis. Do not worry about any scam because it is not for sale and it is not being promoted anywhere. The tests were done only to prove that the game is not unbeatable and it can rather be beaten in the longest tests possible. I repeatedly said that there is a drawback of the methods, triggers and progressions used in the bot, they are not humanly playable. Therefore, it is only a partial win against this game. Nobody is going to play a million spins in a stretch, so it is useless to test them, in my opinion but the tests were done to just prove the cumulative capacity of the bets, triggers and progressions that we use. It is a purely trigger based bettings and all data were beaten with same set of rules/bets. Since this place talks of tests, I thought of mentioning this feat. You may delete all talks about this, if you feel it a scam or sales pitch. There was only one purpose to do test: to prove that the game is not unbeatable and 10 million spins are enough to prove that. Apologies for the misunderstanding, then. Everyone’s comments are welcome here, as long as they are sincere. However, your bot’s results are not the proof you proclaim that the game is “not unbeatable.” If it were, then I have proven the game “not unbeatable” countless times already. As well, I’ve personally worked with countless other system designers and players who believed the same thing about their methods. The difference is I’m able to objectively evaluate the results in their proper context before jumping to any extraordinary conclusions. That is, I know the value of the null hypothesis. Unfortunately, many don’t, and even in light of all contrary evidence and reasoning, they prefer the comfort and hope of irrationalities over the reality that one plus one is always two. It really is a sad commentary of how willing to believe is the human mind, and it extends to all sorts of beliefs, unfortunately those which aren’t as easy disproved with simple mathematics, such as radical religious ideologies. Nevertheless, you are free to believe whatever you want to believe, whether objectively true or not, and I only hope that belief will help you promote more goodness and peace in our starving world. You ask us to believe the impossible, yet you offer no proof. Any high school student could knock your theory. Why did you bother posting if you don’t want to back up your theory ? And your line “I just want to say its possible” reminds be of so many players in FX who think they have the holy grail/secret formula/ alchemy and perhaps even the Holy Covenant – but the one thing you’ve all got in common is an error in your maths. Hmm … I don’t know who Ophis is, but according to his promotion, he wants a cut of the winnings as the fee for using his bot, and when it doesn’t win, the user doesn’t pay. It’s one of the oldest con games of all time: Reap only rewards but let someone else shoulder all the risk. It’s playing with OPM (other people’s money). Well, no surprise, it’s the bread and butter of much of the so-called “investment” industry, as Andrew and I know only too well. Ophis is one of the finest casino bot coder in the industry. He has coded many famous methods of many of the well known forums like Gamblersglen.com, vlsroulette.com, rouletteforum.cc, rouletteforum.net and betselection.cc. He has created free Multi-systems trackers, with which one can see the effect of any method coded upon sessions of any length. Initially we thought of helping other members with renting the bot which is a tracker too but changed the plan later since the bot is fully configurable and one can understand the method fully that way and create another bot by reverse engineering them. A holy grail that keeps on “win more and lose less” may look impossible to you guys because of your erroneous and myopic ways to play the game but it doesn’t mean it doesn’t exist. I am at present working upon repeating the same success of Holy Grail which will “win more and lose less” in a small 2-3 hours session, without touching table limits ever. It will not be for sale because nobody can pay the price of a holy grail but I may give it to one of your testers Roy to evaluate and come up with an honest evaluation here with a condition of non-disclosure. I hope you can believe him at least, even if you do not believe me or Ophis. Any results from Roy yet? Or are you suppressing good news about abalaha’s holy grail? When I asked Roy to test my method he said he needs a ready to use tracker for this. I do not have any programming skills to do this myself, so testings couldnot be done from Roy’s side. He has lost interest in testing anything anymore. I totally understand where Roy is coming from. He and I both have spent literally years of our lives volunteering to help others analyze their systems, all for free. And the only thing we wind up doing is proving over and over again that 1 plus 1 will always be 2. You’d think that systems designers who are so confident that they have the grail would at least be willing to put their money where their mouth is and offer to pay for the work. But, no, all they can do is dangle vast riches as a carrot in front of the noses of honest folks. That alone tells me more about them than anything else. Things have been quiet around here for a while now. I just wanted to follow up to let you know how much I appreciate the work that you’ve done on this site. Between your articles especially this one and my writing, analysis and consulting on the game with other players. I have come to appreciate much more concretely the wisdom you imparted here. For instance, while I wrote two books on the subject. One of them very long talking about the dynamics of the game as well as my live series. I understand clearly the immutable aspects of the game which by the way, is why I love it so much. First, there is the concept of the Gamble, that is, no matter how simple or complex a betting system, it is always betting for something without eliminating the events it is betting against. Players should be aware of the gamble they are making before they start playing. Second, gambling systems give players a false since of security because it makes them “feel” like they are not gambling. However, the fact remains that when players enter a casino and start to play games where they are waging on uncertain events which is an extremely risky thing to do, they don’t control any aspects of the outcomes. But, people feel like they do. Players have a difficult time associating their actions and the actual outcomes of their attempts to win a bet. That is, there is little practical difference in terms of outcomes whan a player plays 4 hands per shoe vs. playing every hand in a shoe. Finally, I have always contended that gambling is a poor way to make money I would even go so far to say that it is impossible, On the few instances in which I play now, I mainly do it for enjoyment. I’ve adjusted my gamble to win as much money as possible if things go my way while keeping my losses as close to the edge as possible which happens to be the final immutable aspect of the game. The house always wins — Long live the Empire! Great hearing from you, Lee, and congrats on your books, and all of your good efforts helping people understand what is realistic about gambling. There is so much more productive and rewarding things one can do with his/her time, energy, and resources. But I’m glad to know you are able to enjoy the activity for its entertainment value, as well. Obviously in a negative expectancy game you are dead meat in any event. I had always thought however that with a big enough bankroll, not bet limit, over a finite career, in a positive expectancy game like sports handicapping that you could create risk of loss that was statistically insignificant. For instance you make three bets a day for 30 years that’s a closed set of 32,850 binary probabilities in a neutral expectancy game. Say you use the Martingale (or better yet a less aggressive negative progression). say you have a bank roll of 10 million dollars and start with a 1 unit bet of 1$. It would take a string of 23 consecutive losses to lose your entire bankroll. Any other result other than a 24+ losing streak results in a win. The odds of hitting twenty in a row is 1 in 16,777,216 tries. the set of 32,850 has slightly less than 32,850 subsets in which a 20+ streak could occur (I think 32,812?) so you have 32,812 chances to hit the 20+ streak. So you have a 1 in 511 chance of hitting the negative jackpot. So one time out of the 511 you lose 10 million and the other 509 times you win +/- 15K. Obviously you can get a better return on 10 million than 15k over thirty years but just theoretically speaking why wouldn’t it work. So if you add to that a positive expectancy game like sports handicapping where you could hope to win 53-56% of the bets and you use a less aggressive progression for instance increasing you bet by 50% after each loss or maybe even something more convoluted then you could certainly expect to improve on that return. Obviously the problem is you would have to start with a massive bankroll and I have never been able to come up with any numbers that would even perform at the level of your average mutual fund, but just as an academic exercise I don’t see why it wouldn’t work. That is sort of the idea of a casino in the first place. You start out with a massive bankroll that will serve to defat most individual players causing them to make emotional “all in” decisions in the first place to your advantage and then just cut every corner and clip every other advantage in your favor (at least to an extent that is not any worse than your nearest competitor). Am making my own system and is working better. If i make 10 units in a shoe i am happy. I play only 20 shoes and do take out 200 units whenever i go. Casino will always win because it plays for infinity. However no player will play for infinity. So i am sure that expert players do can make up some units every day.